Once people learned to cooperate in larger communities—following the growth created by the oscillating pendulum—family clans grew into tribes, and much later, whole nations came into existence. Back and forth, down through the ages we have grown…Here we are today, with much of humanity not yet willing to play well with all our brothers and sisters who inhabit the planet…. 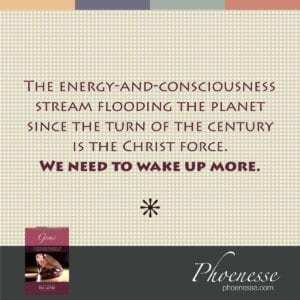 The energy-and-consciousness stream flooding the planet since the turn of the century is the Christ force. It transforms negative material and stagnant attitudes, carrying us along in this process of awakening; but we need to wake up more. We need to come out of our numbness. This is the path to creating a new world in which community living blossoms and individuals can thrive.